Cooler weather expected today across PEI..
Sunday April 30th, 8:15am.. A cold front swept across the island yesterday evening ushering in much cooler temperatures on brisk north winds. These winds will diminish during the course of today dropping off to calm tonight as high pressure approaches from the west. The “high” will crest over the island during the overnight hours tonight then slide east. Clouds will then begin to spread across the region tomorrow morning ahead of a warm front which will be approaching from the SW. This front will move NE crossing the island tomorrow evening with it’s associated cloud and rain. The island then gets briefly into the warm sector with the warm front to the NE allowing for a warm muggy Tuesday. The parent low pressure system associated will actually move from central Quebec into Labrador by Wednesday morning and will keep things unsettled with wrap around moisture on brisk west winds. High pressure begins to approach from the west on Thursday sliding south of the Maritimes on Friday morning. This will maintain cool conditions across the island on NW winds. Another low pressure system will then be approaching the Maritimes from the SW and is expected to bring a wet unsettled weekend weather wise fort the island. Precipitation.. dry today and most of tomorrow. Rain develops late tomorrow evening tapering to showers near noon on Tuesday. A chance of a shower then exists Wednesday and Thursday as cool unstable air moves across the island. Friday now looking bad with sunshine then rain develops before dawn on Saturday and continues through the weekend. Temperatures.. The warm weather of late is GONE for now!!. Cooler, below normal today. slightly above normal tomorrow with a SE wind tomorrow. Warm again for Tuesday and Wednesday. Cool air returns on Thursday then another warm-up for Friday with a SE wind. Cold on Saturday then warm again on Sunday, so a real rollercoaster ride in the temperature department expected next week. Wind.. Brisk North winds now will diminish through the day becoming calm tonight. Very light southerlies expected tomorrow increasing to brisk southerlies for Tuesday. Light-brisk SW on Wednesday becoming NW on Thursday dropping off to light for Friday. Turning cooler tonight across PEI..
Saturday April 29th 5:00pm.. A cold front oriented NNE-SSW currently lies through central NB and is moving eastward. This front will sweep across PEI this evening ushering in much cooler temperatures. Cloud and a few showers also possible with a slight risk of a thundershower. High pressure will briefly build in tomorrow with some cool sunshine then clouds will be on the increase on Monday as a warm front approaches from the SW. This front moves across the island late Monday night putting the island back into the warm sector for Tuesday meaning another brief warm-up. The associated cold front then sweeps across the region later Tuesday bring a return to the cool weather. Cool unsettled weather expected for Wednesday as the associated low pressure system tracks eastward across the northern Gulf. Cool NW winds will blow across the island on Thursday as an area of high pressure approaches from the west. The high will drift south of the Maritimes Friday morning. Long ranger is hinting at a coastal low pressure system approaching from the Gulf of Maine Friday night into Saturday. Precipitation.. Chance of a shower tonight. Dry for tomorrow. Rain spreads across the island late on Monday tapering to showers for Tuesday and Wednesday into early Thursday. Drying out on Thursday then more showers late Friday night into Saturday morning. Temperatures.. The Warm temps of late will be coming to an end this evening with the cold frontal passage. Expect temps to fall this evening with the wind shift to the NW dipping to 5 by dawn tomorrow. Temps stay cool tomorrow with highs only at 8. Back to normal on Tuesday with highs near 11. Brief warm-up on Tuesday with highs near 15 then cool again for Wednesday and Thursday with NW winds off the cold Gulf waters. Wind..Light west now will shift to brisk NW this evening marking the cold frontal passage. Light-brisk NNW winds continue tomorrow but diminish through the day dropping off to calm by tomorrow evening. Very light SSE winds on Monday increasing to brisk southerlies on Tuesday. Winds will then begin to shift to the west for Wednesday then NW on Thursday. Tonight.. Cloudy with chance of a shower, light west winds shifting to brisk NW temps falling with the wind shift, lows 5 by dawn. Friday April 28th 8:00am.. Low level moisture and a southerly flow will maintain cloud and a mild temperatures across the island today. Can’t rule out a stray shower or 2. Tonight a weak cold front will cross the region with more in the way of organized shower activity. High pressure will briefly ridge in over the area tomorrow morning then another cold front will approach from the west spreading more showers across the island beginning later tomorrow afternoon but more importantly, this front will bring in a change in airmass and bring an end to the mild weather of late. Another area of high pressure crests over the island on Sunday with cool sunshine. Next week promises to be a little cool and unsettled with the next system spreading rain across the Maritimes on Monday. Rain continues into Tuesday as secondary low pressure develops along the Maine coast and moves NE through NB. The cool unsettled weather continues through Wednesday with even a risk of some flurries Wednesday night into Thursday morning. High pressure crosses the region Thursday afternoon with some sunshine. Precipitation.. Slight chance of a shower today. Increasing chance of showers tonight with the first cold front. Brief dry slot tomorrow morning then showers redevelop tomorrow afternoon into the evening as the second cold front crosses. Sunny and dry for Sunday. Precipitation will be spreading across the Maritimes on Monday so could be some showers for PEI later in the day. Rain for Tuesday. Showers for Wednesday and Thursday. Temperatures.. Enjoy the mild weather of the next couple of days with temps into the high teens both today and tomorrow. Cooler air floods back in across the island with the passage of the second cold front late Saturday afternoon. This cooler more seasonal air the remains across the island right through next week. Wind..Light-brisk south winds today shifting to westerly tomorrow morning with the 1st frontal passage then further shifting the the NW with the 2nd frontal passage later Saturday afternoon. Brisk NW winds on Sunday dropping off to calm Sunday night. Basically calm or very light east winds on Monday increasing to brisk easterly on Tuesday. Hazards.. None identified except for wet roads during any shower activity. Tomorrow.. Cloudy with showers, light-brisk west winds, highs 17. Mild temps expected across PEI next few days. Thursday April 27th 6:20am.. Unsettled conditions expected across the Maritimes over the next couple days a series of weak systems move through. The first is a weakening low pressure system located near Cape Cod which will continue to weaken and drift ENE into the Atlantic south of NS today. Cloud and chance of showers exists with this feature. The 2nd feature is a weakening cold front which will approach from the west tomorrow afternoon then cross the Maritimes Friday evening with more cloud and chance of showers. On Saturday night another cold front will approach and cross the Maritimes. This front will bring another round of cloud and showers but more significantly, it will bring much cooler temperatures to the region beginning Saturday night. 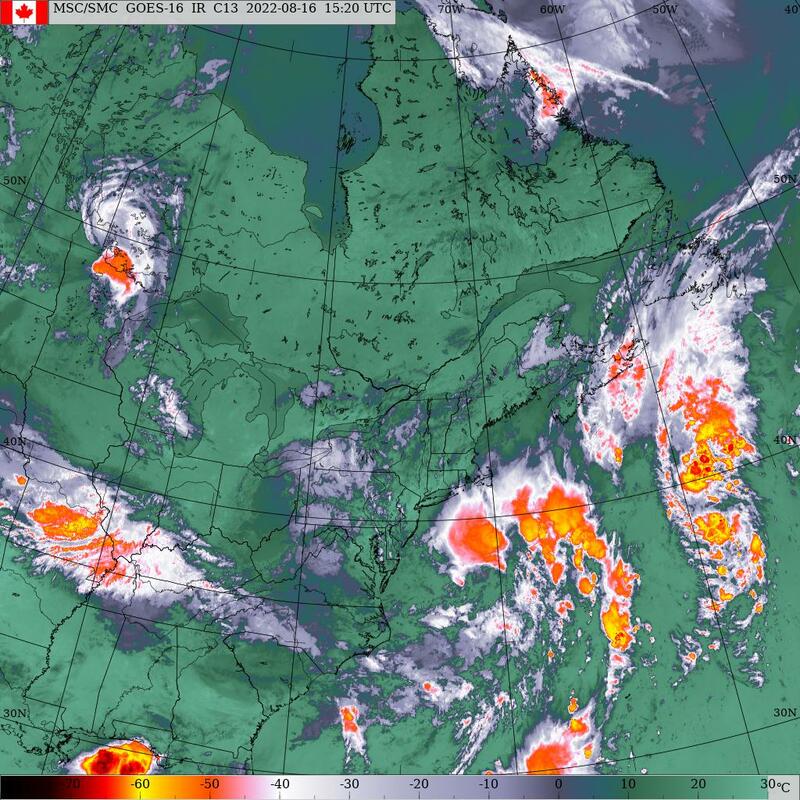 High pressure briefly makes an appearance Sunday afternoon/evening but then skies cloud over again as yet another frontal system approaches from the Great lakes region spreading rain across the Maritimes Monday afternoon. The rain continues into Tuesday as the system crosses the region. Clearing skies on Wednesday. Precipitation.. Chance of showers today tonight tomorrow and Saturday. Sunday looks dry followed by more rain on Monday afternoon which continues into Tuesday. Wednesday and Thursday at this point look dry. Temperatures.. Look fairly mild next few days but then a cool-down expected Saturday evening with the passage of that 2nd cold front. Sunday and Monday expected to be normal then slightly above normal through mid week. Wind.. Light southerlies today and tomorrow shifting to westerly Friday night with the 1st frontal passage then further shifting to the NNW with the 2nd cold frontal passage Saturday night. Light-brisk NW winds on Sunday dropping off to calm Sunday night. Very light SE winds develop Monday afternoon. Hazards.. Wet roads associated with shower activity. Watches/warnings.. None for PEI at this time.. Rain spreads across PEI tonight..
Tuesday April 25th 6:30am.. Good morning… A large area of high pressure stretching east-west is currently located across the Maritimes and will drift northward during the day today, meanwhile high clouds will slowly invade today as an area of low pressure currently located near Cape Hattaras, NC moves slowly NE. Rain from this system should begin over western PEI after midnight tonight then spread across the remainder of the island before dawn on Wednesday. The low will weaken as it moves up the coast dissipating in the Gulf of Maine on Thursday afternoon. Things stays a little unsettled on Friday as what’s left of the low crosses the Maritimes, A cold front will then sweep across the region Friday night. Another frontal system effects the region on Saturday with more cloud and showers. High pressure builds in for Sunday followed bu more cloud and showers on Monday as a warm front moves across the Maritimes. Precipitation.. Rain should spread across PEI during the overnight hours tonight tapering back to showers later tomorrow. Rainfall amounts expected in the 15-20 mm range. Showers possible on Friday and again on Saturday. Sunday looks dry then more showers again on Monday and Tuesday. Temperatures.. Normal today and tomorrow. Warm-up for Thursday Friday and Saturday then a cool down with the frontal passage Saturday night brings us back to normal for Sunday and Monday. Wind.. Light northerly flow now will become SE tonight increasing to brisk southerlies for tomorrow. Light southerlies for Thursday and Friday shifting to westerlies on Saturday then northerlies on Sunday. Hazards.. None today, wet roads after midnight tonight and will continue tomorrow. Dry conditions expected next couple days across PEI..
Monday April 24th 8:45am.. Good morning.. Put a temporary stop to the blog while I spent a week on the beach in the Dominican Republic. Now back to reality. A weakening cold front oriented NE-SW is currently draped from Anticosti Island southward across eastern NB then extending SW towards southern Maine. This front will stall and dissipate today. A nice day in store for tomorrow as high pressure crosses the region although clouds will be on the increase as an area of low pressure moves up the coast with rain developing by Dawn Wednesday morning. The low itself is expected to dissipate off Cape Cod by Thursday evening but conditions are still expected to remain unsettled as another area of low pressure approaches from the Great Lakes. Precipitation.. Dry today and tomorrow. Rain should begin before dawn on Wednesday morning. The rain could be moderate to heavy with early indications of 25 mms before tapering to showers late Wednesday evening. Could see a few showers Thursday through Saturday. Sunday and Monday looking good at this point. Temperatures.. Slightly below normal today then a nice warm-up expected mid week then another cool down for the beginning of next week. Wind. Very light winds today and tomorrow with high pressure over the region. Southerlies then expected Wednesday through Saturday. Hazards… Nothing in the short term. Wet roads and possible significant rainfall on Wednesday. Watches/warnings.. Nothing for PEI at this time.. Mild today and Tomorrow…Turning cold on Monday. Saturday April 15th 10:20am.. An area of high pressure has slipped to the SE of the Maritimes now and will continue to move away to the SE, meanwhile a warm front oriented NW-SE is located across Maine and will move NE today resulting in increasing clouds. There could also be a stray shower from this. Tomorrow a low pressure system form the Great Lakes will ripple NE along the warm front and is expected to track through central NB in the evening then across PEI during the overnight hours. This system will give more in the way of some organized rain to the island. The associated cold front will sweep across the island near dawn on Monday ushering in some cold air. Temps will respond by falling through the day on Monday with even some flurries or periods of snow in the NW winds off the cold Gulf waters. Tuesday remains cold but sunny as an area of high pressure crests over the island. Wednesday will see increasing clouds as another low pressure system from the Great Lakes approaches with rain developing before dawn on Thursday. The rain may initially begin as snow but should change over to rain before noon on Thursday. The system weakens and moves eastward along the Atlantic coast of NS this keeping the island on the cold side. High pressure briefly builds in for Friday giving some cold sunshine followed by yet another low pressure system from the Great Lakes for next weekend. Precipitation.. Chance of a shower tonight. Organized rain begins near midnight tomorrow night ending near dawn on Monday. Flurries or light snow expected Monday afternoon once the cold NW winds kick in. Tuesday and Wednesday should be dry. Snow begins after midnight Wednesday night changing to rain before noon on Thursday then ending later Thursday afternoon. Friday should be dry then showers begin Saturday. Temperatures..Normal today, above normal tomorrow. Cold on Monday and Tuesday. Normal on Wednesday then slightly below normal for Thursday and Friday. Wind..Light-brisk WNW now shifting to southerly tonight which will continue through tomorrow. Winds then shift to the NW with the passage of the low and cold front before dawn on Monday morning. Northerlies then continue for the remainder of Monday into Tuesday dropping off to calm Tuesday night. Southerlies develop on Wednesday. Hazards.. Short term None identified… Long term, could be some ice roads Monday night into Tuesday morning. Monday.. Cloudy with rain ending early, snow developing near noon, light-brisk north winds, temps steady near +1 then falling below zero overnight.